It’s official: hibernation season is over – and spring is on the horizon! When the first warm rays of sunshine beam down, it's time for a wardrobe refresh. How fitting that the new womenswear, menswear and kidswear collections arrived just on time to add a burst of spring to your wardrobe. The post-holiday season means it's time to get back to business! Navy blue replaces your beloved blacks – and adds a twist to your business dress code together with soft lilac details. Sophisticated pinstripe dresses add a feminine touch to your look. Smart blazers – worn alone or with matching trousers – are always absolute essentials for Boss Women who want to show up to the next business meeting in style. The workday is winding down and your after-work outfit is ready to go. The ultimate all-rounder is eagerly waiting to be worn. Our jeans collection is always a hit thanks to a wide range of washings and fits. You’re guaranteed to find the perfect denim look for every occasion with such a large selection of denim styles. Denim lovers are now spoiled for choice – dresses and skirts made of the trendy fabric are great it-pieces for creating loads of styles uniquely your own. Red jackets and red plaid coats add an eye-catching touch to any outfit. Sweaters and blouses in multi-colour stripe designs are the perfect companion to any denim style and are sure to create carefree looks wherever you go. Head-to-toe in blue work best when combined with a denim shirt. Let your creativity flow – the styling possibilities are endless! 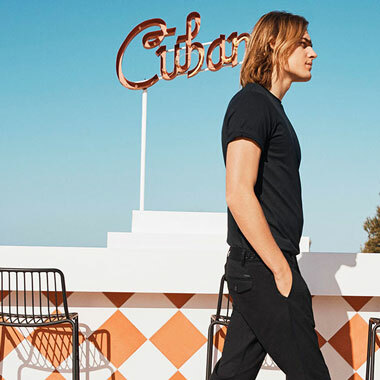 Menswear is all about high-quality basics that are must-haves for every closet: from versatile polo shirts to T-shirts, all the way to comfortable hoodies and sweatshirts. Neon colours give a fresh kick to the men's collection. Always a trendy hit: Athleisure! For sporty-casual outfits sneakers are an indispensable essential. Spring also means wedding season is finally here. It’s pleasantly warm outdoors, the flowers are blooming and we can finally celebrate outside again. Our wedding and party styles with light nuances, fine details and delicate fabrics match the springtime vibes. Whether bride, maid of honour, groom or guest – festive evening dresses, jumpsuits and suits make everyone say a resounding “yes”. Men swap their classic black suits for a trendy version in blue or grey. Anyone who looks that dashing is definitely invited to join the party! We hope you love discovering Esprit’s 2019 Spring Collection and enjoy your spring in style!